It will be on a raised slab. I like a decent front porch, don't want the expense of any masonry half columns and won't need any guardrails. I'm stumped in this regard. Last edited by GLKIRK1; 12-16-2016 at 06:25 PM. As someone that is paying over 3% a year on taxes and insurance, almost more than my 15 year mortgage's payments were. Homes aren't quite the investment asset they should/could be in our current tax and spend governments era. the trick is choosing options that increase your homes value to you and yours and resale value, but aren't taxed at their true worth. You by chance find those blue prints? Don't do rookie mistake of Not stacking all the stairs in the same column. Draw the plans from the stairway framing first, then kitchen/pantry to garage entry, an "air lock" can save a few dollars every HVAC day forever, as they cut down on air changes during entry and egress. Over depth joists and or floor trusses with thick subfloors actually are lower labor allow the HVAC plumber to make $ with out destroying the ceiling heights in the basement. Stack the bathrooms vertically...basement to 2cd. Cantilevered floors away from the street view. install the same windows in the garage walls as house, consider 2x 6" framing with 2' stud centers, with an up grade on sheathing and 5/8th drywall. 9' wall heights, 5 % more, 12.5% MORE VOLUME. Use a 4 x 8' grid if possible for plans,don't forget the diamond layout marks at 5 to sheet of plywood, 19.2" centers for studs and joists option for spacing. Up north where it's all heating, tall ceilings buy you higher heating bills. Totally agreed,however,I will gladly absorb the extra cost for the aesthetic value they yield both inside and outside. On the exterior,8 ' walls play heck with and limit the eave overhangs + provide not much of a chance to have much if any wall showing above windows. They cause the building to look squat. I concur with the old adage "first we shape our buildings,then our buildings shape us". I don't want to reside in a squat hovel . I'm not sure where the limited eve overhang comment comes from, Victorians around here have wide overhangs and 8' second floors. No. This one has the basic elements. You've got to have "the eye" to visualize what can be done with a basic 8c ranch. I could move/add/delete a zillion things on this basic cutie pie. That nuance is explained pictorially in Jonathan Hale's book The Old Way Of Seeing. One way the eave overhang can be address is with a roof kick. A kick will get you additional widths for the eave without dropping down further on the wall,however,will not result in a positive gain of wall area above windows. The joy of tall ceilings. Not saying they do,just a possibility,those homes may have been balloon framed,where the ceiling joists were placed may have been at 8',however,the wall may have been taller,in essence,creating a knee wall for added attic space. Just a possibility,not saying for sure. These are all conventional balloon framing, so top plate on the wall studs, then ceiling joists and rafters go on top. Architecturally, a lot can be done to make a stylish house that's comfortable to live in no matter the ceiling height. Some of the old houses in Salem Massachusetts have ceilings not much more than 6 1/2 feet. Here's one. Not very stylish by today's standards. There are a lot of old stone houses in PA that aren't much different from a 1 1/2 story trailer. 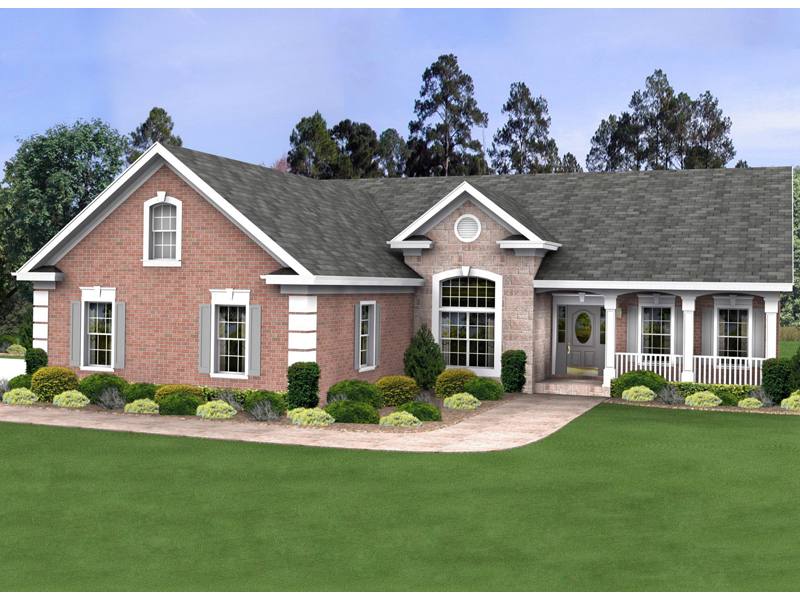 Architectural interest is added by doing things like having 5 cross dormers and adding roofed porches front and rear. Window choice completes the style. Totally symmetric. I am your best bet for the house design you want. P.S. See how fashionable and trendy I am? I wrote my name with a lower case A. Using a ledger board instead balloon framing every where could solve the issue of trusses being instead the insulation blanket partially. And do away "Energy" trusses..
What I didn't like about the 8C ranch pictured is the floor level nearly at grade, I got nothing against one step entries, But I do think anywhere it rains more then 3 inches a day every hundred years, yard level first floors are silly and senseless waste of money IMO. That's precisely what I like about it. PS: Any elevation can be, well, elevated.